Using our 3D pancake maker the PancakeBot can be a challenge. The box for our unit, which we call Stackie, is right at the size limit for checked baggage so it must be checked in. There’s always the chance we’ll get to your destination with our suitcase but no Stackie. Stuff like that happens. For example, Stackie was MIA when I arrived back in Orlando after the Berlin show. Good thing it was on the inbound side. It took about a week before some guy in a nondescript white van mysteriously pulled up and dropped the wayward robot off at my front door. I figure Stackie must have hit the beer gardens pretty hard leaving Germany and then went on an extended bender in and around Dublin. Oh, the stories Stackie could probably tell. Will Stackie be temperamental or decide not to work, at all, when the audio/video guy points at you with an excited “GO!”? That happens too. At the Summit, Stackie only printed dots for the first two or three pancakes and then settled down into a more or less working state. With many more gadgets to transport, manage and operate for this show, the risk of demo success was a bit amplified. I have a deep appreciation for successful garage bands. You get to play for the audience AND haul all the gear around AND make sure it all works. I felt like a roadie, part of the time. Looking for excitement and nearly constant motion? This is your kind of gig. Stackie usually sits on a table up near the front of the room. There needs to be enough room for the power strip, Stackie itself, space for batter making operations and a pancake staging area of plates and napkins. We used a second table for the steampunk devices I also brought along. There was a three-foot gap between the two tables so I could easily get out into the audience. I always like to bring things out and show people a few details. I think it adds authenticity and credibility to the talk topics. Standing between the two tables, looking out at the audience, the gadgets were on my left and Stackie was to the right. In this sort of setup, make sure you have enough room behind and to the sides and in front of the tables. Also try to practice your routine of walking around the tables and out into the audience, before the show, if possible. I like to use slides as visual cues and time markers for the topics I cover in my tech talks. 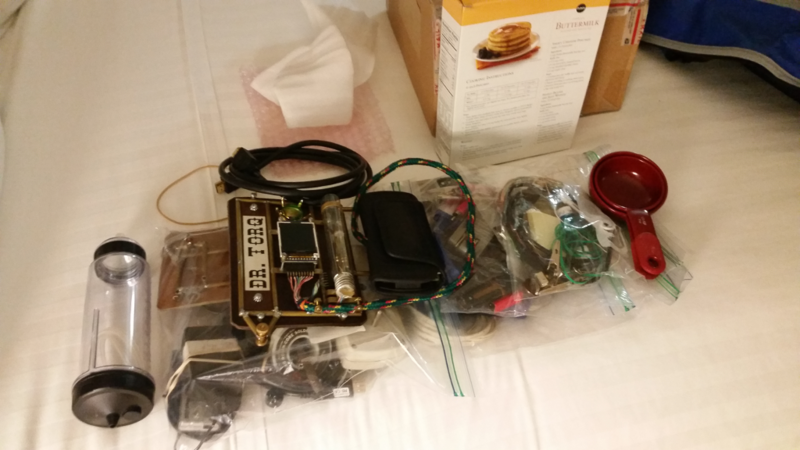 For my presentation at the breakfast, we decided that we wouldn’t coordinate the hardware demo with slides. The good news is that you can get the same effect with the arrangement of your hardware devices. For example, this talk had to fit into a 10-minute slot, so I put the first device to the far left and worked my way back to the right. The last two minutes or so would focus on Stackie, so moving over to the right-hand table, provided a mental transition and subtle indicator that we were approaching the time limit. Of course, I had my smartphone with a large display timer running during the presentation, sitting to the left of Stackie on the table. Don’t ever guess at where you are with your timeline in a presentation. Rehearse with a timer so you are used to using one when live. Then use it during your talk. I kicked off the presentation with a very brief Dr. Torq bio and an explanation of physical computing and steampunk, which are the basis for many of our Off-The-Shelf Hacker stories. Keep in mind that anytime you actually run a device demo, there’s always a chance of it not acting properly or even crashing. Next, I discussed the difference between the Arduino and Raspberry Pi. Ten years into the microcontroller revolution and people are still confused between the two. Arduino is a firmware-based device, while the Raspberry Pi has an operating system. We started to pick up speed, then, when I presented my Steampunk Eyeball. People like to see movement in demos and one reason I chose this device was that it would track an object as I moved around the stage. Some viewers have called it magic. Audiences seem to like the complexity and oddity of the Eyeball. Perhaps, in the future, we’ll have to build a bigger Eyeball, because this breakfast had about 100 people. I know the back tables had a hard time seeing a 12-inch tall device. Of course, you know what that means: Bigger boxes and more weight to haul to a show. Those are the tradeoffs. Next, I covered the first gen Arduino/1.8” color LCD Steampunk conference badge. All I had to show was the brass skeletal frame and leather back. That was OK, because it showed the immaturity of my badge development, in its current stage of development. 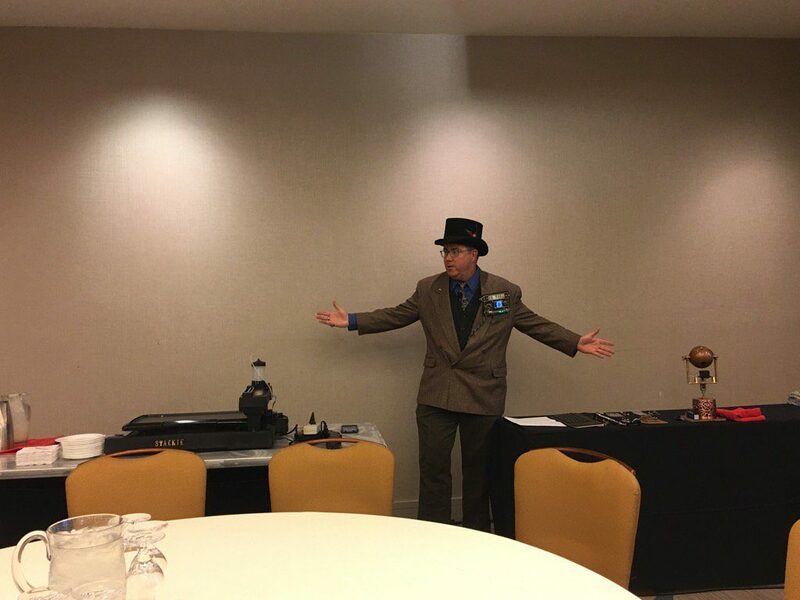 I then moved on to the two-piece (fourth gen) badge that I wore, when paired nicely with the steampunk garb and top hat I wore during the presentation. The device is big and gaudy while complementing the steampunk vibe and Stackie PancakeBot. Certainly, the audience could see it when I walked around on stage. A few attendees came up and asked questions about the fourth gen badge at the end of the panel discussion part of the show. The fifth (and current) gen badge was the last device I covered, before moving over to summarize Stackie. I put this device toward the end of the talk because it was the most refined out of the bunch and would likely draw a lot of attention when wearing it out on the conference floor. It certainly did… people remembered the badge and steampunk get-up from the pancake breakfast. Naturally, that provided an opportunity to mention The New Stack and talk about the site and podcasting operation. Keep in mind that anytime you actually run a device demo, there’s always a chance of it not acting properly or even crashing. You might consider only demoing gadgets that are stable and have a good track record of booting up and doing what they’re supposed to do. I’ve talked to speakers in the speaker’s lounge who were up all night getting their product running. That’s a tough road. Granted, things happen and tweaking is absolutely necessary sometimes because the “show must go on.” It’s best to start early on organizing your hardware demo and be obsessive about your prep. So there you have it, a glimpse into the seriously interesting world of conference hardware demo “shows”. It’s fun and provides a great connection back to TNS articles. And, Hey, Stackie, don’t forget us, next time. Roadies like refreshments after a show, too.